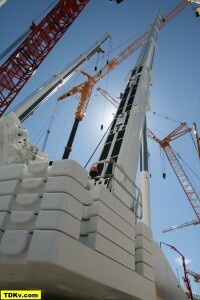 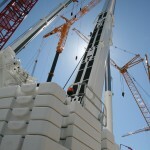 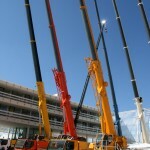 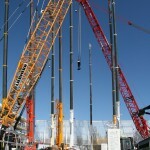 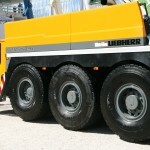 Liebherr shows a wide range of different mobile cranes, tower cranes, mobile tower cranes and crawler cranes. 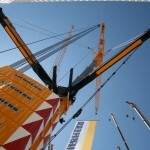 Beside many well known crane types, Liebherr again has a completely new huge crawler crane on display: the Liebherr LR 11000. 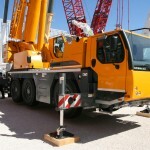 The Liebherr LR 11000 is a crawler crane with a maximum load capacity of 1000 metric tons. 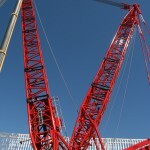 Maximum main boom length is 156 meters. 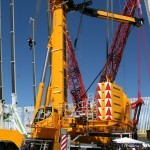 Optional available is the Power boom which is already known from the LR 11350 and the LR 13000 crawler cranes. 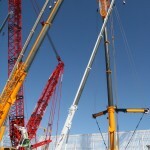 The maximum configuration of the Power boom is 150 meters. 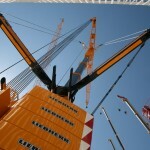 A luffing jib with max. 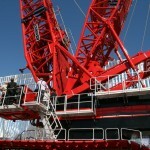 114 m is also available. 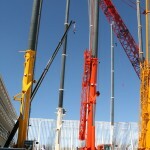 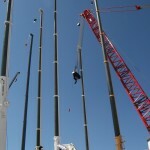 A derrick boom system with various options for the suspended ballast is increasing load capacities to a maximum. 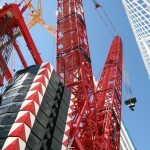 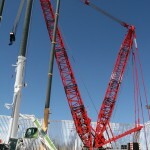 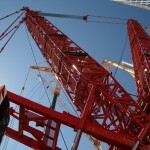 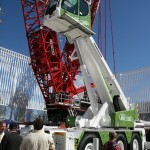 The crane was designed with optimized transport dimensions and weights. 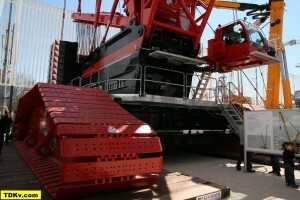 The LR 11000 is closing the gap between the 750 tons LR 1750 and the LR 11350. 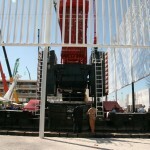 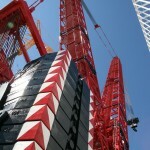 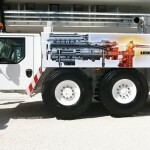 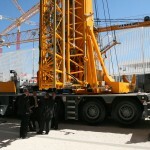 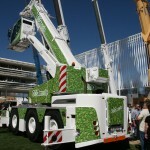 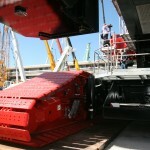 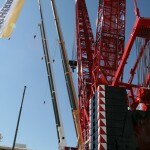 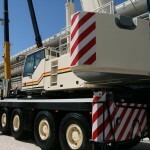 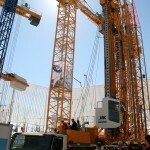 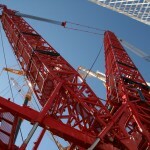 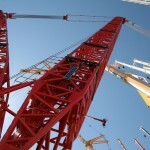 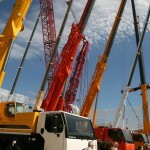 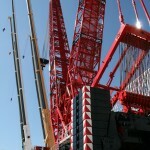 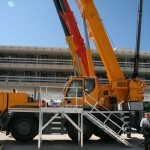 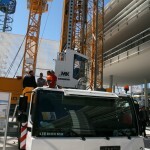 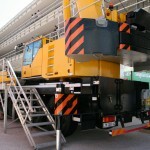 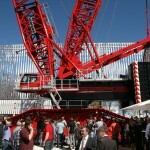 The crane shown on the Liebherr booth was painted in Mammoet colours (What else? 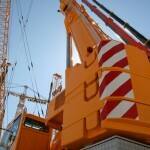 ;)). 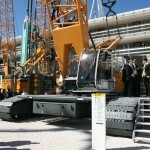 Also new is the LR 1250 crawler crane from Liebherr in Nenzing. 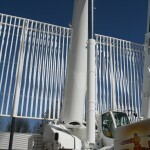 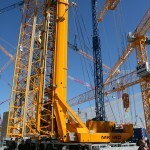 It has a maximum load capacity of 250 tons and offers a main boom length of 117 m (light) and 86 m (heavy). 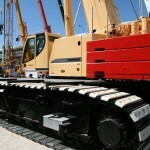 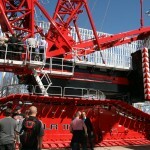 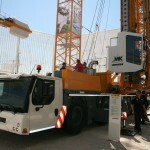 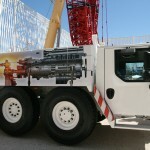 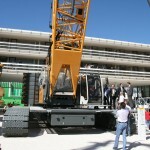 The LTR 1220 telescopic crawler crane was officially launched during the 2012 Liebherr crane days in Ehingen. 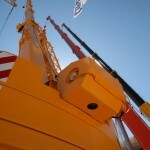 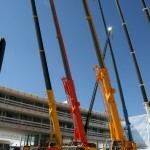 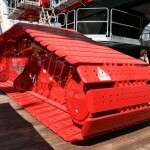 At the Bauma it is shown in the colours of the crane company Weldex from Scotland. 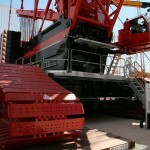 Though the delivery of the LTM 1750-9.1 just started at the end of January it is in fact also sold many times already. 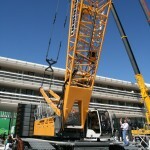 As mentioned these crane models are already known. 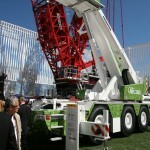 Completely new and for the first time to be seen in iron are two new all terrain cranes in the range of 60 metric tons and 300 metric tons. 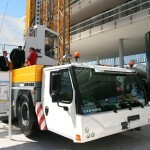 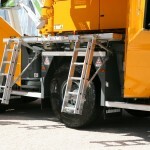 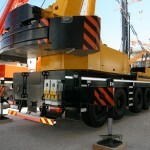 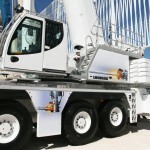 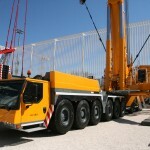 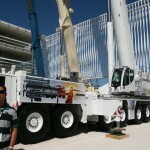 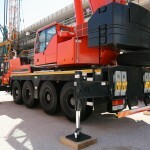 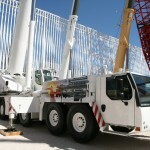 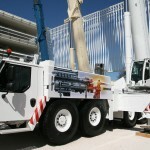 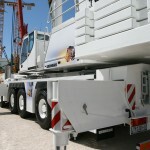 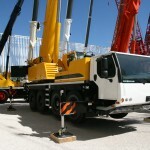 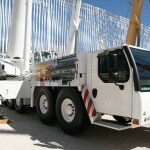 The new Liebherr LTM 1060-3.1 is a 60 ton telescopic mobile crane with a 3-axle carrier. 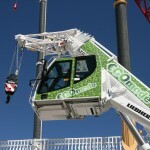 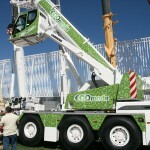 It has a 48 m telescopic boom. 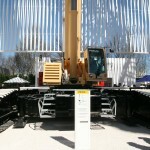 This is the longest boom in its class. 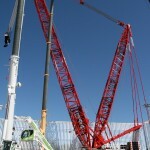 This can be prolonged with a double folding jib of 9,5/16 meters. 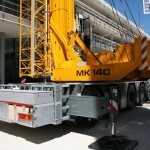 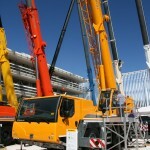 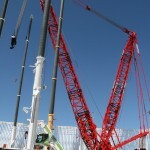 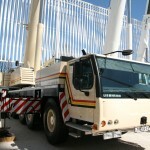 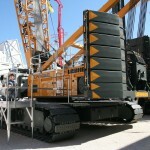 The Liebherr LTM 1300-6.2 will replace the very successful and long time built LTM 1250-6.1. 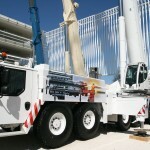 It is a 6-axle carrier crane with a maximum load capacity of 300 metric tons. 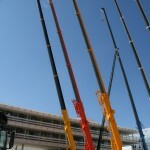 The main boom has a telescopic length of 78 m. Additionally available are a 35 m folding jib, optional hydraulic or mechanic, a fixed jib with max. 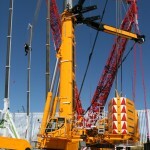 42 m and a luffing jib with a max length of 70 meters. 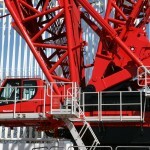 Gear shafts are routed from the distributor gear in the substructure via two mitre gears through the centre of the slewing ring to the pump distributor gear in the superstructure. 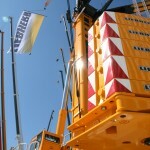 These are only some of the news from Liebherr in short words. 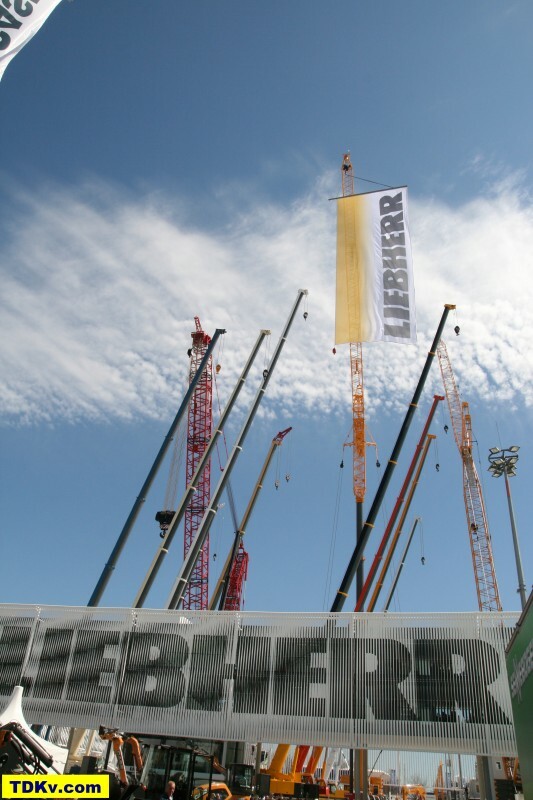 In order to give you an impression of the Liebherr booth at the Bauma 2013 please browse through the big picture gallery below. 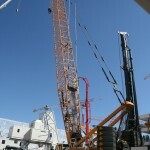 A click on the pictures will open them in high resolution, so loading time might be a bit longer. 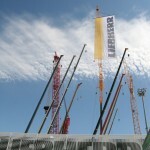 Enjoy and please feel free to leave me a comment below.